Long title: The Province of Artois and the country adjacent By William de l'Isle Geoger. Member of the Royal Academy of Sciences at Paris. Copper engraving with original outline hand colouring: 67.6cms x 55.2cms; image size 594mm x 480mm. One hole in left margin, one margin short split, both well away from map area else very good condition. 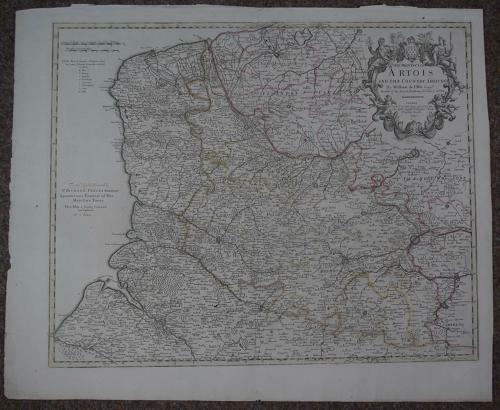 John Senex's re-engraved re-issue of De l'Isle's map of the region in northwestern France from Senex's rare 'English Atlas' first issued from about 1710 as a collection of maps. 'Senex was an engraver and map seller, later cultivating his scientific interests as a maker of instruments and globes. In the early part of his career from about 1706 to 1711, he was in association with the London publisher Charles Price and together they produced sets of large (double-folio) sized maps... The partnership... split up in 1710.' (Shirley). This map of Artois in northern France is highly detailed and includes the areas of Abbeville, Boulogne, Calais, Dunkirk and Lille. Finely engraved with a highly decorative cartouche it is both uncommon and in very good condition.